injinji Toesocks are one of the most best-selling home fitness and exercise equipment items on the Internet. The softness, simplicity and functionality of injinji Performance Micro Toesocks make them tremendously popular with women who exercise. injinji Toesocks are 70 percent CoolMax, 25 percent nylon, 5 percent Lycra. They are anti-friction, lightweight, and breathable. injinji Performance Micro Toesocks are engineered to create separation between your toes and prevent skin-to-skin friction that can cause blisters when you exercise. injinji Toesocks are soft, wick moisture away from your toes, and enhance healthy circulation. They are great for runners and cyclists. Many people who wear barefoot shoes for running swear by the them. 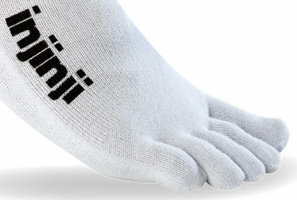 injinji Toesocks are an excellent addition for your home fitness and exercise equipment list.